Coastal Cities are a brand new indie-dance band comprised of five 17 year olds (yes, 17!) from High Wycombe, west of London. 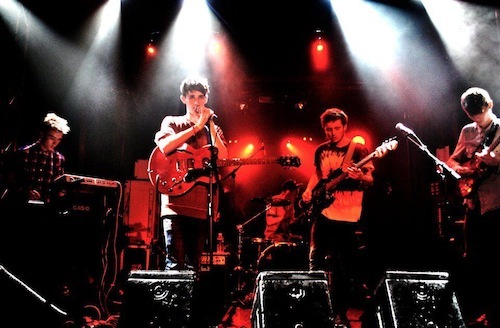 Declan Cullen (guitar/vocals), Sean Semmens (guitar) and Lewis Slade (drums) met in the Summer of 2009 and after recruiting Dan Hardy (bass) and William Clark (keys) Coastal Cities was formed. Inspired by The Smiths, Joy Division and other 80’s New Wave bands, but also by dance music, Coastal Cities set out to make music people like them could relate to but also that they could dance to. Soon after the band posted their first songs on Soundcloud, The Drums tweeted that they couldn’t stop listening to “Think Tank” and French music bible Les Inrockuptibles said the song was “irresistible”. The band delivers snappy, upbeat songs that combine the jangly guitars of Two Door Cinema Club with the implacable hooks of early Foals. Add some synths and the occasional yelps and you get a fantastic mix of indie rock with dance inclinations. But the most surprising thing about Coastal Cities is that, despite their young age, they seem to have a pretty clear vision of the kind of music they want to make and they go for it in with so much passion, it’s almost impossible not to like them!